It goes without doubt that Nick Cave and the Bad Seeds are not to be shunned by anyone who values dark and romantic music. Formed from the ashes of The Birthday Party (1983-1985) the band released multiple albums and is renowned for their noir perception on love and the world. Obviously, a challenge for the band was to keep things creatively interesting. Guitarist Mick Harvey, a patriarch member of The Bad Seeds, already brought this to the attention when The Boatman’s Call released in 1997. It was no secret that creative estrangement was increasingly on the rise within him. A year after the garage-rock inspired Dig, Lazarus, Dig!!! (2008), on which the biblical story of Lazarus is repositioned to present-day New York, Harvey decided to end his 36-year-long musical collaboration with Cave. After this weighty knot was cut, the remaining members diverted the focus towards their various side-projects. Cave finished up writing his second novel, The Death of Bunny Munro (2009) and composed two movie scores with another Bad Seed, Warren Ellis. Most attention was paid to their noisy blues rock spin-off band, Grinderman. After a successful second record in 2010 Cave and his colleagues drew the conclusion that Grinderman was done for. At least for now. Drummer Jim Sclavunos told the press it was time to move on and announced the resurrection of The Bad Seeds. Honestly I lost track of the aforementioned activities. That was until a few months ago when Warren Ellis’ Dirty Three rocked their socks off in my hometown. In the days that followed I ended up re-listening much of the catalogue Nick Cave and The Bad Seeds created throughout the years. Besides this, I found out The Seeds kept word and announced their fifteenth official album, titled Push The Sky Away. For starters, I have to underline the fact that Push The Sky Away is by no means a continuation of Dig, Lazarus, Dig!!! Do not expect piercing guitars, vigorous piano play and Nick Cave who sings at the top of his lungs. We No Who U R directly unveils a new found path of minimalism. Instead of traditional instruments The Seeds subtly make use of a drum machine accompanied by synts, soft flute scales and barely hearable backing vocals. On Wide Lovely Eyes this atmosphere continues, possibly leaving Seeds adepts puzzled about what’s next. With the looping violin play of Ellis more tension is built up on Water’s Edge. Hereafter the band finally strikes with the delightful melodic Jubilee Street. Alas this delightfulness is effectively pushed away by the meandering songs that follow. Whilst the use of rich and small soundscapes is precise, it also causes a sense of hollowness. On a lyrical level the band also changes its style. The willfully deforming of biblical and folk tales is replaced with arbitrary cross-referencing. Evidently this is a critical reflection on contemporary society which is flooded with information. On the track We Real Cool, Cave sings: “Wikipedia is heaven when you don’t want to remember no more“. Ironically Cave admits the writing was partly done by means of “Googling”. During the enjoyable Higgs Boson Blues, Robert Johnson, Lucifer and Hannah Montana are lugubriously linked to each other. With the title track, the album concludes in a sober manner: “And if your friends think, that you should do it different. And if they think, that you should do it the same. You’ve got to just, keep on pushing, keep on pushing. Push the sky away” Could this be a reckoning with the recent past? Or is about a an open-minded future? Either way, these lines seem proper enough to wrap it all up. When hearing the album for the first time it will not be unlikely one will struggle with the beauty that drowns and flourishes at the same time. To me, Cave’s soft voice combined with elements of minimalistic electronica easily debouches into a state of dullness. Hence it takes a few spins to get accustomed to the fact that Push The Sky Away is meant to be a slow-boiling and tense showstopper. Nevertheless, the departure of Mick Harvey did not cause the band to cling to the past. Resolutely they take a step into a different direction which should also be appreciated. Whereas the countless small gestures are indeed of a minuscule level, the record eventually becomes a well-crafted whole with tarts of black humor. 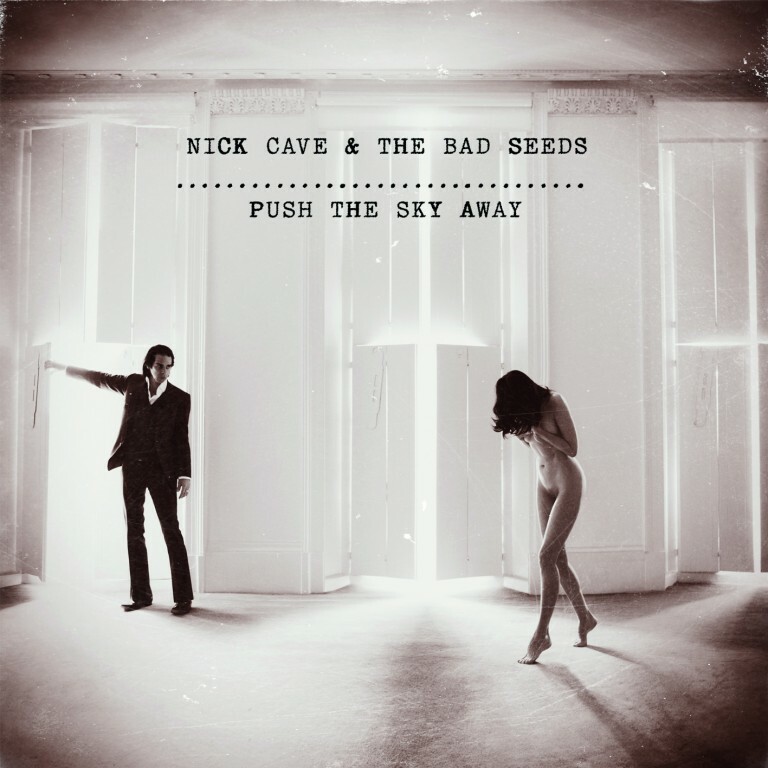 After five years of absence, Push The Sky Away can been conceived as ‘a’ rebirth of Nick Cave and The Bad Seeds. When the older work of the band is examined it becomes perfectly clear that capriciousness has always been a part of their rationale. I’m fairly sure that the sky is clear for the moment and a limitless future is still theirs for the taking. And of course only time will tell if musically patterns will be shifted once more. Until then you should pluck up some courage and give this leap into a world of simmering tensions a chance. This entry was posted in WRM and tagged Bad Seed ltd., Darkness, Dirty Three, Grinderman, Jim Sclavunos, Melodic, Mick Harvey, Minimalism, Minuscule, Music, Nick Cave, Nick Cave and The Bad Seeds, Push The Sky Away, review, Sober, The Bad Seeds, The Birthday Party, Warren Ellis. Bookmark the permalink.